It’s time for action. If the generations before us won’t do anything, then you can count on us to make change. We Students of America are here today to demand our lawmakers ban assault weapons like the AR-15s. Ban high capacity magazines and bump stalks. Expand background checks to cover all gun sales. Stop taking NRA money and federal fund gun control research. And you can count on us to make that change happen if our lawmakers do not! Thank you. Garfield students rally on the front steps of the school. Photo by Jesse Hagopian. Then Talis called for seventeen minuets of silence to represent the seventeen students and educators killed in Parkland. At the beginning of each minuet they read out the name of one of the victims. As the names were announced, I saw several students in the crowd bow their heads and let lose a deep cry. The NRA, the Secretary of Education, and the President have all called on teachers to arm themselves as a response to school shootings, but this new student uprising has countered that that guns are not school supplies. And the youth are demanding a comprehensive approach to safety that can get at some of the root causes of violence in our society. One student was carried a sign for gun control that also said, “End Toxic White Masculinity”–demanding that we look at how school shootings are connected to issues of race and gender. Students who walked out in Chicago produced a list of fifteen demands that redefined what it means to be safe at school. They made important connections between the movement for gun safety, the movement for Black lives, immigrant rights, education funding, opposition to corporate education reform, and more, showing why they should be running the city—and the nation for that matter. Talis concluded the rally at Garfield by saying, “Please continue to educate yourself and make sure that you are setting the example for those who come after you. We are the generation that will change this.” With plans for a mass rally in Washington, D.C. on March 24th and another nation-wide school walkout on April 20th, these students have only just begun the struggle for their very lives. 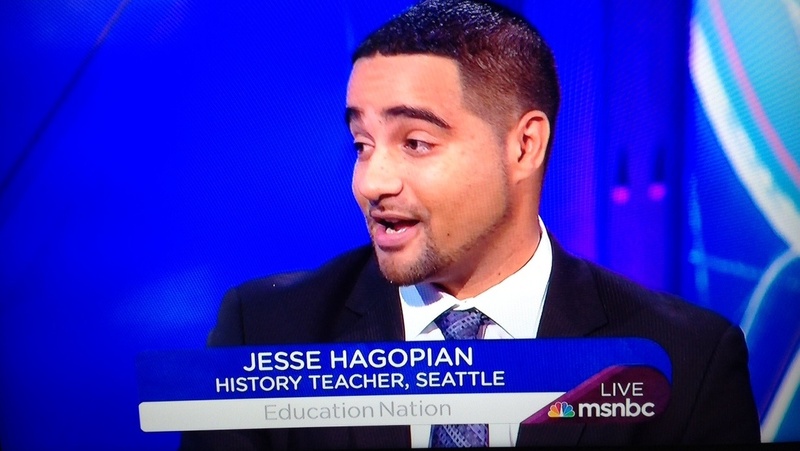 Jesse Hagopian teaches Ethnic Studies at Garfield High School. He is an editor for Rethinking Schools magazine, The Seattle Fellow for The Progressive magazine, and blogs at www.IAmAnEducator.com, Jesse is the co-editor of the forthcoming book, Teaching for Black Lives. You can follow Jesse on Twitter at @JessedHagopian. IT is wonderful to imagine kids across the entire country being able to work together through social media to refine and then hold strong to NATIONAL demands. With unity of demand, this protest has so much potential to make change.